The curriculum is broad, varied, challenging, balanced and flexible and is aimed at developing the full potential and evaluates the student’s needs. The main Public Examination for Class 10 and the courses leading to this are normally provided along with introductory courses for future competions. In early years of Nursery, introduction to the languages and Mathematics will be given in a playful method. Classes Nursery to U.K.G. follow a ‘Foundation Book’ framed for the students that are really required for their progress. In the beginning years from L.K.G. to Class 2 a proper foundation is given in the three languages of English, Telugu, Hindi along with Mathematics stressed on the writing, reading and understanding skills. Along with this, a few basics of Science and Social Studies are stressed. At stage 1 from Class 3 to Class 5 with their proper knowledge of languages and Mathematics from the previous years Environmental Studies (includes Science and Social Studies) is introduced as a subject, and teaching is emphasized on all the subjects. Along with this, they participate in many activities relating the theory and practice. 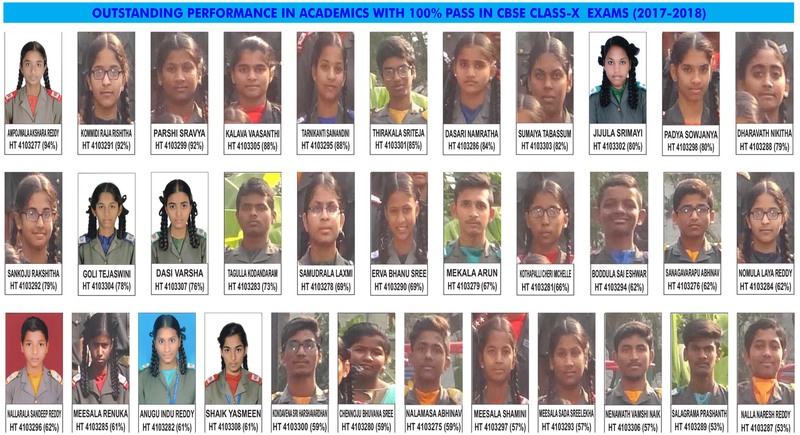 At stage 2 from Class 6 to Class 10 children pursue continued programmes of work in English, Telugu, Hindi, Mathematics, Science, Social Studies, Computers along with Art, Dance, Music, Physical and Health education etc. From primary to high school all the three languages are given priority. English is the medium of instruction for the subjects. For all the classes basics are stressed along with this mentoring is done for each student based on their performance and checked daily in each subject. A separate evaluation cell looks after each student’s academic progress on daily basis. Curriculum is dealt with in a variety of teaching methods. Class teaching becomes interesting with the usage of modern digital and material aids along with individual research to learn the topics using reference books and other text books from other syllabus especially for the high school. Thus a student attains perfection in the topics covered in any subject through theory and its practice in Biology Lab, Physics Lab, Chemistry Lab, Computer Lab, Multimedia rooms and vast gardens. Each student from Class 1 to Class 10 are made to write the entire lesson from text book twice during June to December and twice during January to April. This makes them perfect with the entire syllabus by the end of the academic year. Lesson writing helps them to know them new words, sentence formation, paragraph arrangement and hard work..
Parents are charged contribution for educational visits. We do try to keep the cost to a minimum as these visits are important for your children. Short visits and long visits are conducted. Short visits done where to State Museum, Health Museum, Planetarium and Film City. Long visits done where to Delhi, Jaipur, Agra, Kolkata, Gangtok and Darjeeling. All teachers share a part of the guidance and counseling and according to the need and circumstances, it is given by Teacher, Career counsellors, Guidance counsellors and Senior Administrative staff members. We work in close partnership with our school community, as we have recognized the mutual benefits of a cooperative approach to education..
Each student from Class 1 to Class 10 are made to write the entire lesson from text book twice during June to December and twice during January to April. This makes them perfect with the entire syllabus by the end of the academic year. Lesson writing helps them to know them new words, sentence formation, paragraph arrangement and hard work. Slow learners are checked regularly. As per the revisions carried out through out the academic year leave no slow learners. Homework will be set throughout the school, the amount depending upon the age of the students. It is felt that such work gives some opportunities for students to develop independent habits of study and helps students to prepare themselves for further education when much has to be done without the guidance of teachers. Not all homework consists of written exercises. Homework includes : 1) Writing, 2) Reading, 3) Preparation for new work, 4) Completion of work started in class, 5) Revision and practice exercises, 6) Preparation of projects and exercises, 7) Back ground research (ex: current events), 8) Learning vocabulary or important facts, 9) Revising for class tests or examinations, 10) Train the memory Homework should be seen as an essential part of a child’s education and an excellent way of involving the parents in the progress of the child. Whatever homework is given we do appreciate the parents help in seeing that it is done properly, on time and in surroundings conducive to good work. Parents can assist by : 1) Taking an interest in homework, 2) Checking the students dairy daily, 3) Helping the students to plan time effectively, 4) Providing a quiet room, a chair, a table and good light. The curriculum requires teachers to assess their students by using the target levels found in the subjects. We recognize the importance of assessment but we are also concerned that any assessment reported to parents should not only describe a child’s academic performance but should also provide an all round picture of the child’s development in all areas. Part of our own assessment procedure involves the children in the assessment of their own progress. Parent / teacher meeting is held regularly so that teachers can share their observations and assessments with parents. Children are also included in this dialogue so that they can share their achievements. Grade wise reports are issued at the end of each examination. We hold parent teacher meeting every Saturday when you can discuss progress with your child’s teacher. If for any reason you wish to discuss about your child at times other than parent teacher meeting please do not hesitate to make an appointment. This will ensure that either the Principal or the Class Teacher will be available to see you. The main aim of parent teacher meeting is to make parents familiar with curriculum, home work patterns, the home school reading links etc. Continuous and Comprehensive Evaluation (CCE) is followed for academic progress of the student. Weekend tests of every Saturday’s serve this purpose. Syllabus for the academic year from L.K.G. to Class 10 is completed during June to December of each year and the months January to April are spared for two revisions. Thus students attempt annual exams without any exam tension. As the annual exams are attempted with revision the last minute preparation is avoided. The skill of writing is improved through a separate writing hour spared for them to write well as well as to improve their basics that answer the basic word of foundation. Better handwriting is taught through the handwriting books designed by the school which make the students to learn proper strokes of alphabets in three languages of Telugu, Hindi and English. Mathematical tables are stressed as a part of basic Mathematics. Each class has maximum strength of 35 and all classes work to the individual child abilities. Languages and Mathematics are considered to be the base till the beginning years then after other subjects are introduced. The students are assessed in writing, reading, and understanding. A separate hour is spared to improve their skills in writing and to improve their basics according to their age. A separate department headed by Basics Development Officer assesses the performance and improvement of each student on daily basics. The students understanding and their participation in school are closely monitored.